The title of this post goes to Vanderie who was teasing me when I asked if the Russian search site had a special note listed for me. They didn't but I was at work at the time and Van told me that it had me listed as the fluffiest bear of them all. I liked that. My bear life is complex. It seems that my time is split engaging in two types of PvP. There is the pewpew kill all the things yarr I'm a pirate yo ho ho and a bottle of ISK that I do out in space. But, I spend as much time, if not more, waging quiet market PvP battles. They are both absorbing but one doesn't leave kill mails. If I didn't speak about it no one would know it happens. I often wonder if anyone cares about my market PvP. I don't know. It is an odd question to go up to someone and ask if they care. I know that they do. Their prices remain reasonable as long as I fight the fight. But it is intangible. Friday night contained two major battles for me. The first was a PvP fight. I latched onto Kaeda and he found himself the FC of a small 3x Caracal 1x Jaguar fleet. I almost moaned in bliss as I undocked my Jaguar. I've mostly been flying interceptors or DPS since we came down to Syndicate/Solitude. I missed my Jaguar. Of course, as soon as we undocked the Caracals killed a Merlin before I could even lock it due to distance. I was miffed but I knew they'd need tackle anyway. Our roam was interesting. Kaeda roams far and wide which is fine with me. Off we went to somewhere I've never been before. It felt good. I love roaming. Flying, jumping, being with the fleet, getting little fights, its fantastic. Poor Robinton wound up caught in a LAWN bubble as he an Kaeda tried to blap something. Down to two Caracals and a Jaguar we kept going, following Kaeda as we went somewhere else that I don't know where we were. That is when Kaeda found the Legion sitting on the sun uncloaked and tackled it. We were two caracals and a Jaguar vs a Legion. Some might immediately call us a blob and call it a gank. Oh how I laugh at such a thought. That fight went on for fourteen minutes. I went back and checked my logs. That is several lifetimes out in space, fighting. The legion was tanking us and tanking us. We were switching points, warping in, warping out. He had faction points and webs because I was scramed and webbed at 16k. The constant bouncing in and out allowed us to rep shields and forced him to keep changing his targets. When Kaeda thought we were breaking him I decided to sacrifice the Jaguar. I had been hovering outside of his point and web range, occasionally taking damage, and keeping him locked down. When we were maybe breaking him I decided to go in and add my Jaguar's scratching. Maybe that would tip things over. A Jaguar is more than a fair trade for a Legion or a good attempt at a Legion. It was an interesting time. I was scramed and webbed but under his guns. I kept manually piloting at an angle into him with everything I had to keep him from hitting me. It seemed to work. He was also focusing on Kaeda who was through shield and armor and bleeding structure when he finally broke and we took him down. At one point Kaeda was trying to convince a random Thorax in local to come help. Said Thorax warped in at 100 but never joined in on one side or another. With the Legion wreck looted, we found ourselves panting and amazed. Several times we were rather sure that he was not going to die. True Good Fights were exchanged in local as we left. It was an awesome fight that kept dragging itself one way and then the other. Artimis and Kaeda lost their Caracals a few jumps later to gateguns trying to take down a Scythe Fleet Issue. Kaeda reshipped into a Jaguar he had at a random station nearby and the two of us worked our way back to Pert. After killing things we did some logistics. I find the moving things to and from this Solitude/Syndicate area to be a miserable experience. If someone with more tolerance than I came and did the reasonable market in Solitude they'd clean up. I noticed today that I may have won the battle against my relister. There are no over priced cynos listed in our system anymore. I know that the relister purchased almost a hundred cynos and last time I looked he had twenty five listed. Now there are none listed in our home system and they are just scattered around the rest of Solitude at their ridiculously high price. Have I won the fight? It isn't worth their time to list because I will undercut them. It isn't a forever thing. As soon as I leave or stop listing they can go back to what they did before. But in the general sense of making it not worth their time to clear me out and relist, I feel as if I am making progress. The over priced orders are vanishing and going elsewhere. The locals are stocking from me as well. It isn't a glamorous battle. Nor is it one that I can clearly wave at people to show them what I do with my time. But it is there and I do spend a lot of time engaged upon that field. With that type of action I create a home field. My market alt is crouched atop a billion ISK in consumables to restock from potential buyouts. I haven't figured out if I do this market this the right way or not. I do at least do it productively. That is how I PvP as well. I learn, and then do, and try to improve from there. I never know if I'm doing the right thing or if I am any good at what I am doing but I try to be a solid, useful presence on the field and in the market. 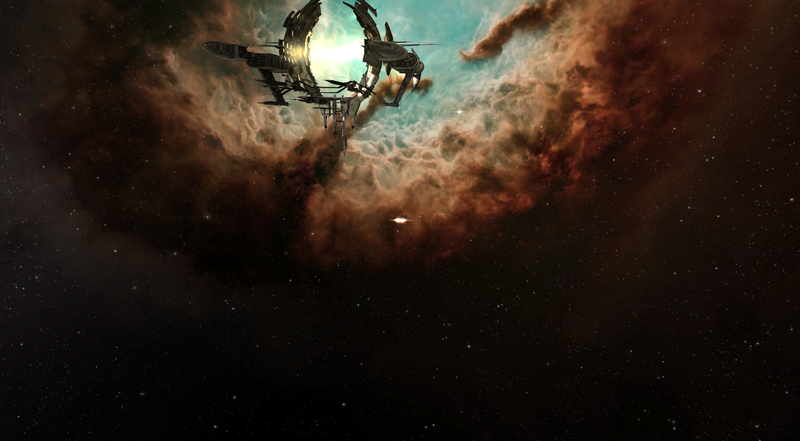 It has safely arrived in Jita, dropped it off in a station and had red frog deal with it from there. Sounds like a good fight Sug. And yeah, 14 minutes is a lifetime when you're fighting the up-hill fight. Good Job all. Knock Knock? Who's there? T2 Rigs! T2 rigs, who? T2 rigs not on your damn blingy 1.6 bil legion FOOL.